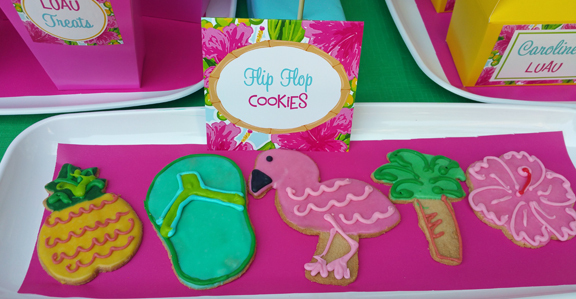 This entry was posted on July 10, 2018 by thatpartychick. 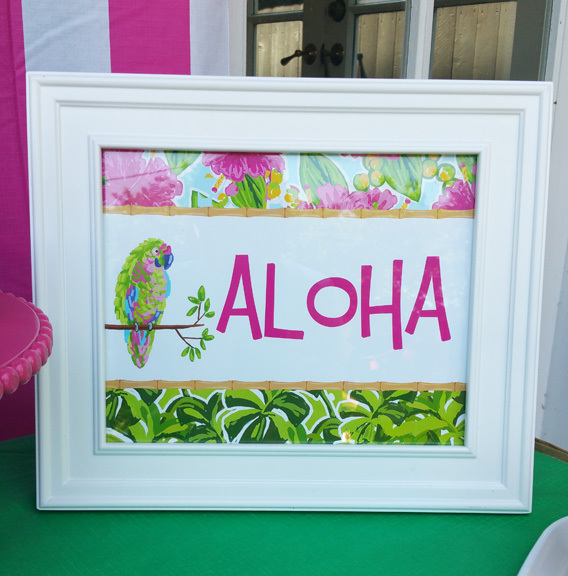 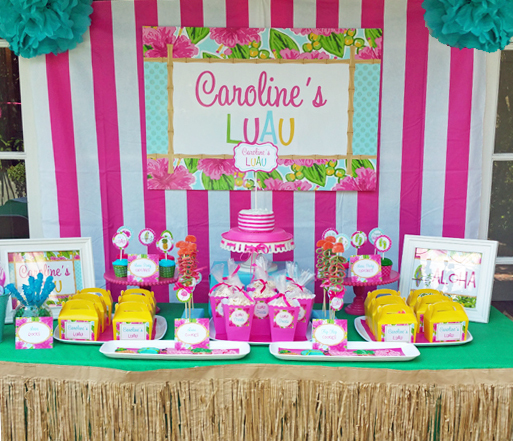 Aloha and welcome to Caroline’s Luau! 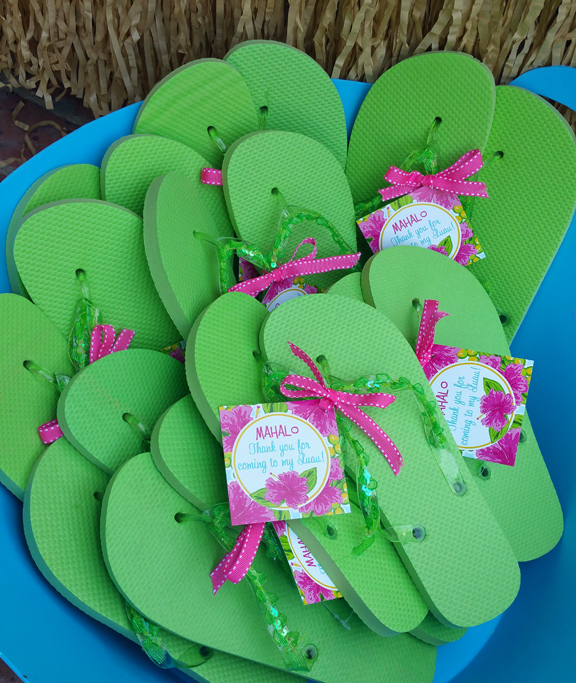 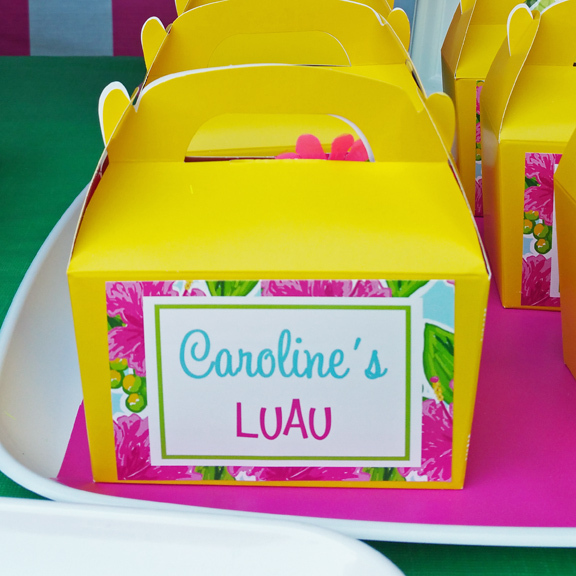 The sunny day and poolside atmosphere were perfect for a fabulous Hawaiian themed celebration! 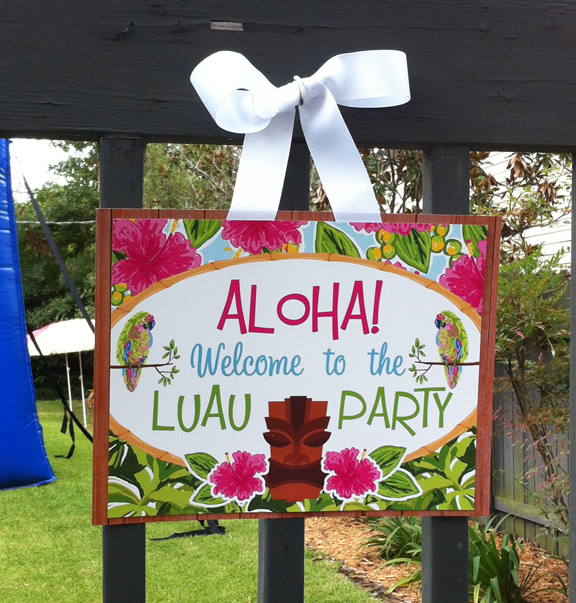 A sign on the garden gate greeted arriving guests. 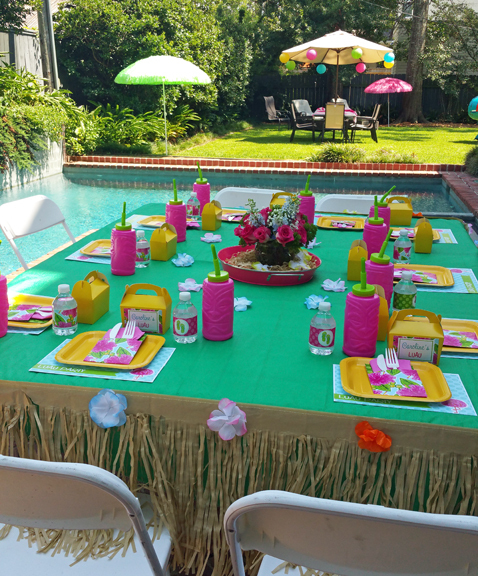 Colorful umbrellas and inviting party tables were stationed throughout the yard. 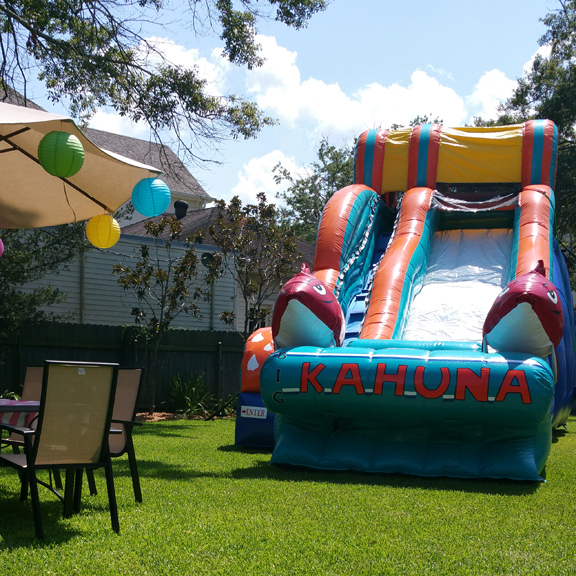 Perhaps of most interest to the girls was the oversize Kahuna waterslide! 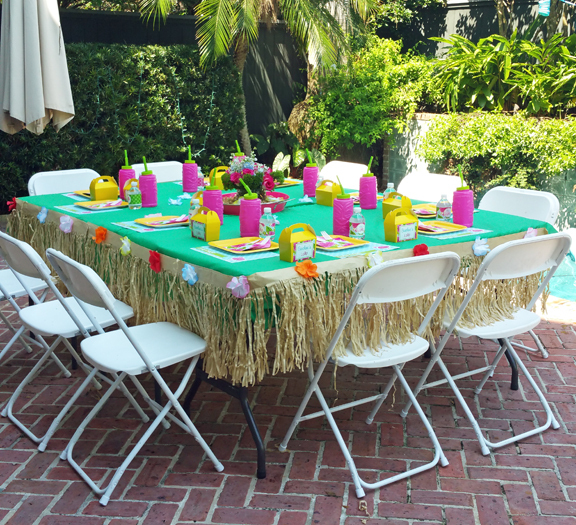 A grass skirt bordered the table where the girls each claimed their place for food, beverages, and party favors. 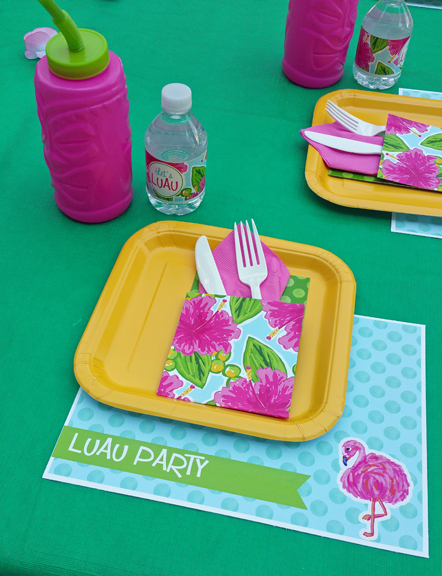 Placemats included a flamingo, and specially designed party paper envelopes held napkins and cutlery. 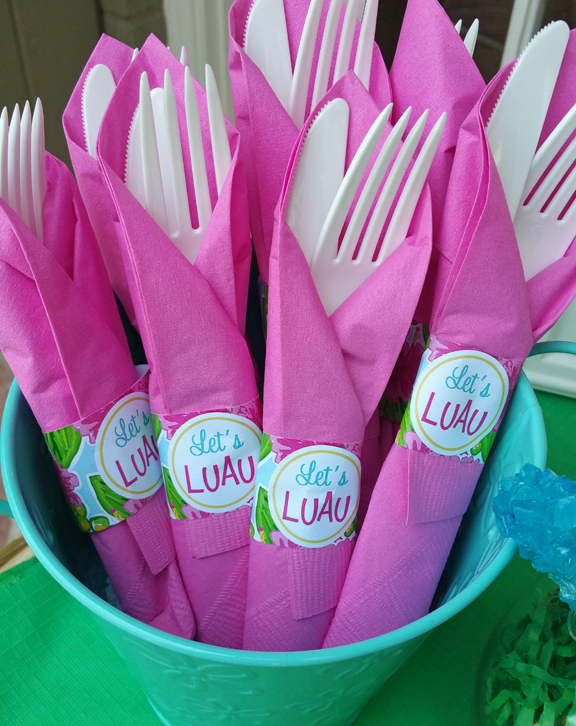 Tiki straw cups were at each place setting and were repeatedly filled with refreshing beverages throughout the party. 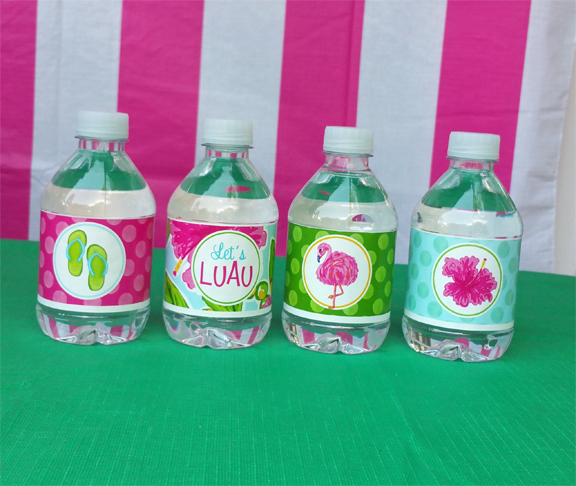 Hawaiian themed pool party water bottle labels were festive. 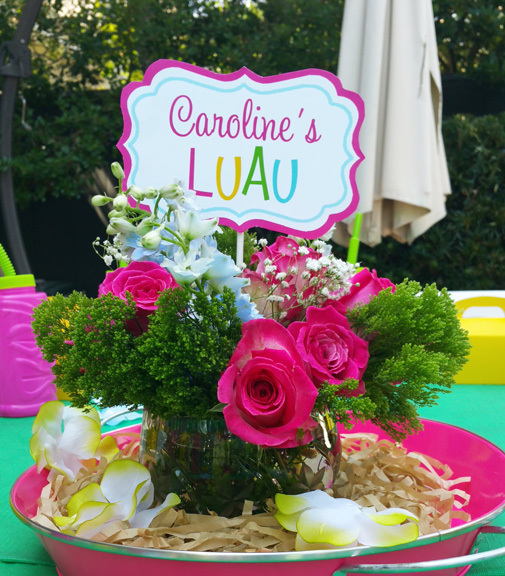 A “Caroline’s Luau” centerpiece topper was positioned in a beautiful floral arrangement, which had the look of the tropics. 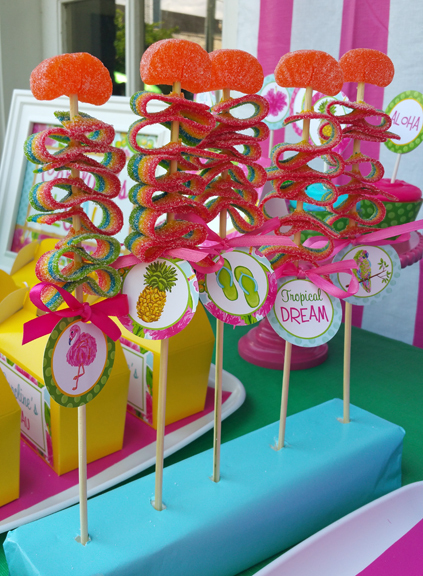 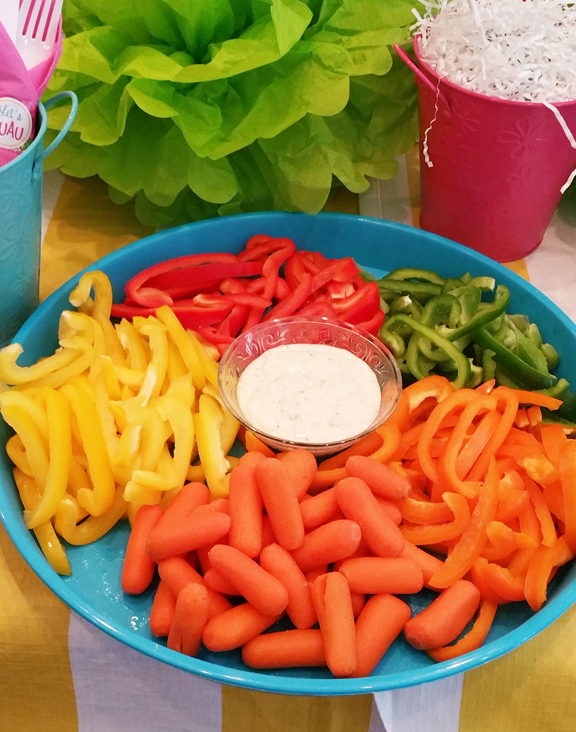 The dessert and snack party table was styled with colorful treats. 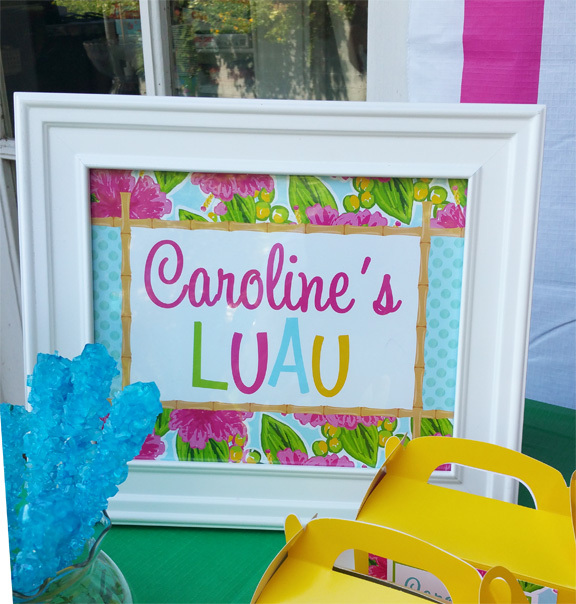 “Aloha” and “Caroline’s Luau” signs were strategically placed. 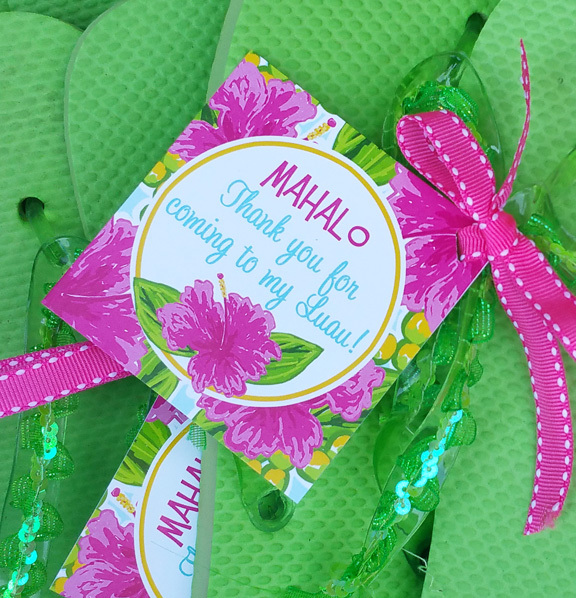 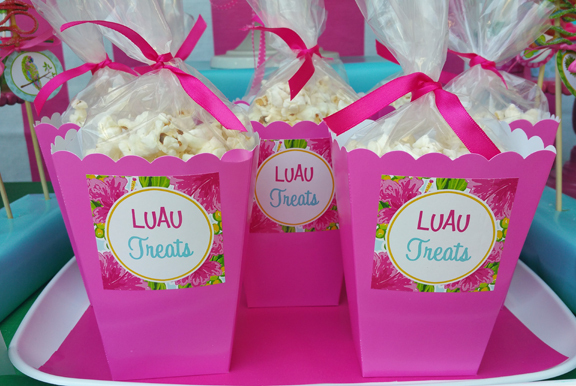 Snacks included party popcorn, candy kabobs, “lava” rock candy sticks, and adorable luau cookies. 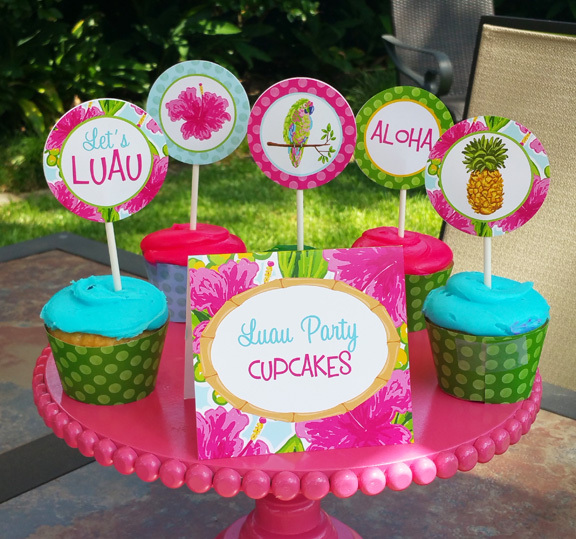 The cake and cupcakes were decorated with cupcake toppers in keeping with the party theme. 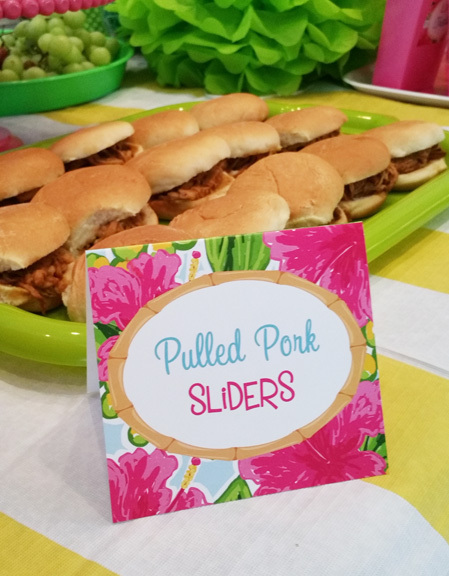 Guests dined on a variety of other party foods including Subway sandwiches, pulled pork sandwiches, a chips, fresh fruit, and raw vegetables. 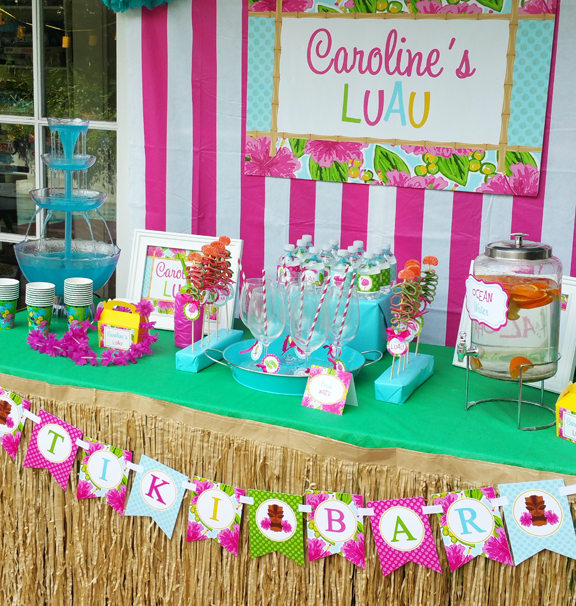 The “Tiki Bar” drink station was a hit. 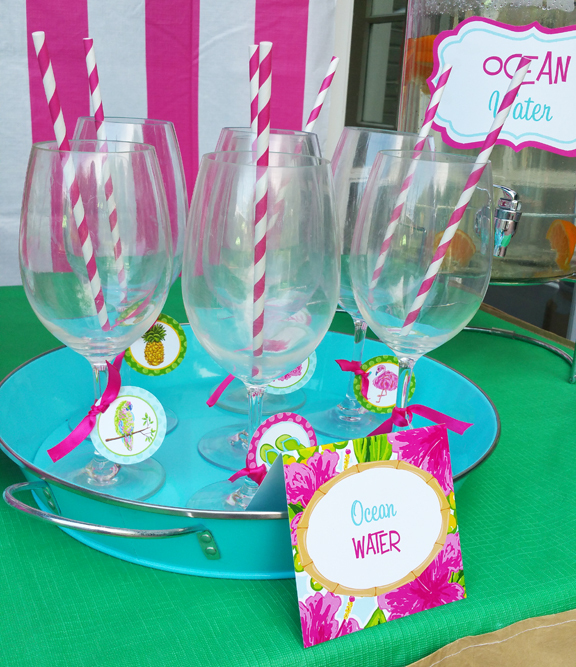 A fountain flowed with blue punch, and a dispenser of fruit-infused “Ocean Water” quenched the thirst of the younger guests. 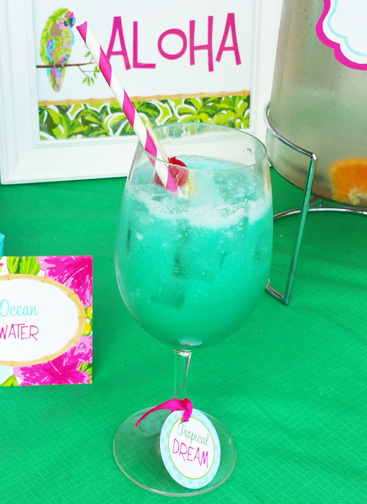 The adult guests were treated to “Blue Hawaiian” frozen drinks in footed stemware.